On the previous page, a few weeks back, we’d ascended the steps by Castle Mills Bridge, passing the sign for Brownie Dyke. My apologies for leaving anyone interested hanging about on one side of the river, in this imaginary walk around the Castle Gateway area. I really couldn’t write about/care about this in recent weeks. More important things going on. We can cross the river now, over Castle Mills Bridge. 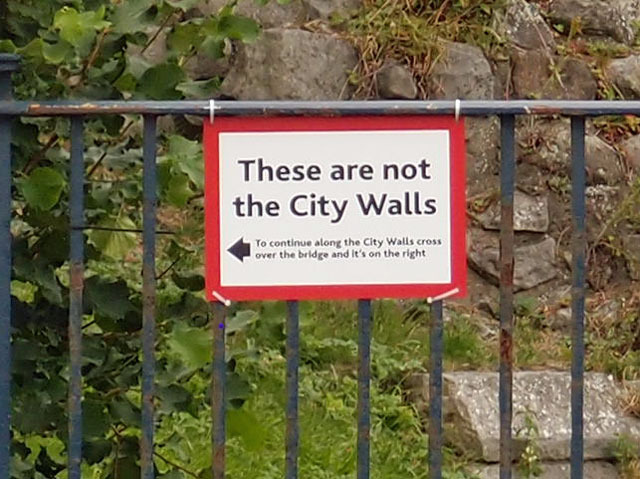 And in doing so look back, to the steps, and the sign for Brownie Dyke, and the city walls just behind, pictured above. It’s easy to forget how close we are to the city walls, when we’re in the confluence/Foss Basin area, as the busy road with its traffic cuts through, making us less aware of this proximity, and how the landscape all links together, or used to. After ascending the steps by Castle Mills bridge you have to walk some distance in either direction to find a pedestrian crossing. Or you wait, for a long while, for a gap in the traffic, as I had to after spotting these signs across the road and wanting to get a photo of them. These signs have been put up since I was last up this way taking notice of my surroundings. I was amused/interested, but was dashing past and thought I’d take a photo some other time, too much traffic in the way. But then remembered how I’d often wanted to take a photo of the old wooden sign for Brownie Dyke, and that I don’t seem to have one, and that it has since been replaced. So it seemed worthwhile to walk back a few yards, and to wait for what felt like a few years, for a gap in the traffic. No chance of crossing without waiting even longer and then dashing across in a possibly dangerous fashion, so a photo from the opposite side of the road would have to do. My first three attempts were obscured by fast-moving cars, taxis, and a brave man on a bike tackling the rush-hour traffic, until at last an unobstructed view appeared. Because of the distance, and it being a rather gloomy day, the images are rather fuzzy, but it’s worth a closer look at these signs. I found the signs amusing when I saw them, but they’re also thought-provoking, now I’m back at home assembling this page. Years ago there would have been no need for these. That they’re there is all about this being a tourist-focused city, about the ‘visitor offer’ (a phrase I still can’t read without feeling a complicated mix of negative feelings). They’re there because of concerns about tourists getting lost, so we have to fill the place with explanatory signs, yet more visual clutter, usually detracting from the attractiveness of the place rather than adding to it. 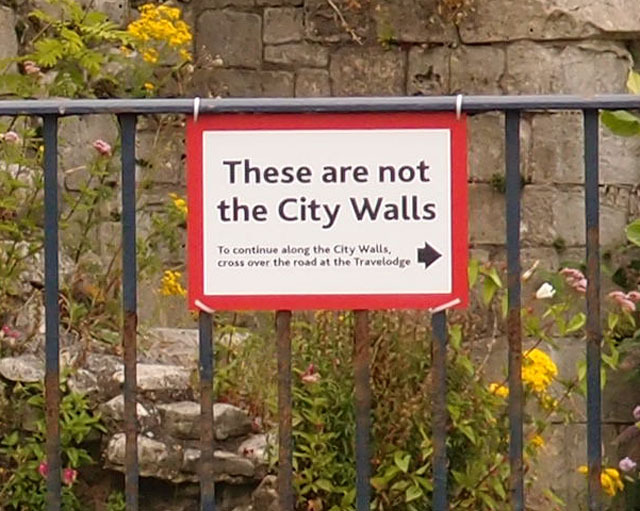 And on this one, aiding visitors in the search for the other bit of the city walls, a Travelodge has become a landmark, an aid in wayfinding. Just one of several Travelodges in the city and around the area, part of the general rush to invest in and profit from York and its ever-expanding ‘visitor offer’. 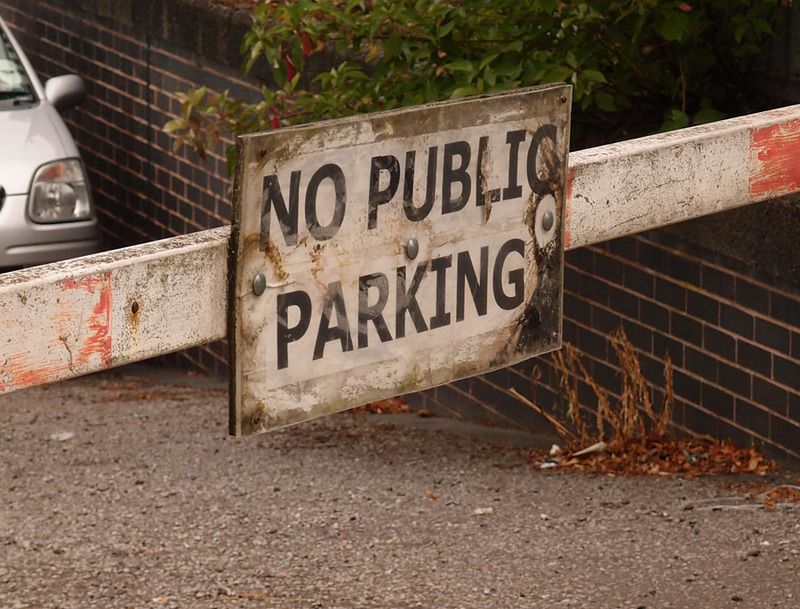 We can’t park here, but that doesn’t matter, as I’m on foot, as usual. And because of that I can sidle past the barrier and park myself on the perimeter of the Foss Basin. As I did one afternoon ten years ago, in July 2007, and that was one of the reasons for revisiting here in July 2017. On the previous page I included a couple of the photos from my 2007 visit here. I took quite a few, but they’re mainly quite dull. Mainly focusing on old bits of wood, trying to be arty, with a new digital camera I’d got that year. One of the good things about digital photography is the timestamp automatically added to photos. From this I can see that there was a fairly lengthy gap, about 20 minutes, between the photos taken up on Castle Mills Bridge and later ones taken down here by the water. I remember that I just sat around for a while not taking photos, just being here and doing nothing much. Just absorbing the spirit of the place. One of the photos from 2007 will do, as an illustration. It was quiet. The photo above shows two people fishing on the car park side of the water and two or three people fishing on the Fishergate side, closer to the Foss Barrier. No one else around, as I recall, just me and them. The My Castle Gateway project has asked us to think about what we want to be able to do in this area. What I’d like to be able to do in the Castle Gateway area — or in particular these bits of it by the Foss — is the same as I already can, which is to find a quiet place with not many people around where I can sit and look at water and trees. Looking behind, rather than ahead towards the confluence, there’s a striking architectural variation. The handsome structures are across the other side of the busy road previously mentioned, while the building in the foreground is here on this side, in the Foss Basin. It’s quite scruffy here, around the Foss Basin, by Castle Mills. Weedy and quirky and a bit ramshackle. Not much of this kind of thing left now, in the city centre. 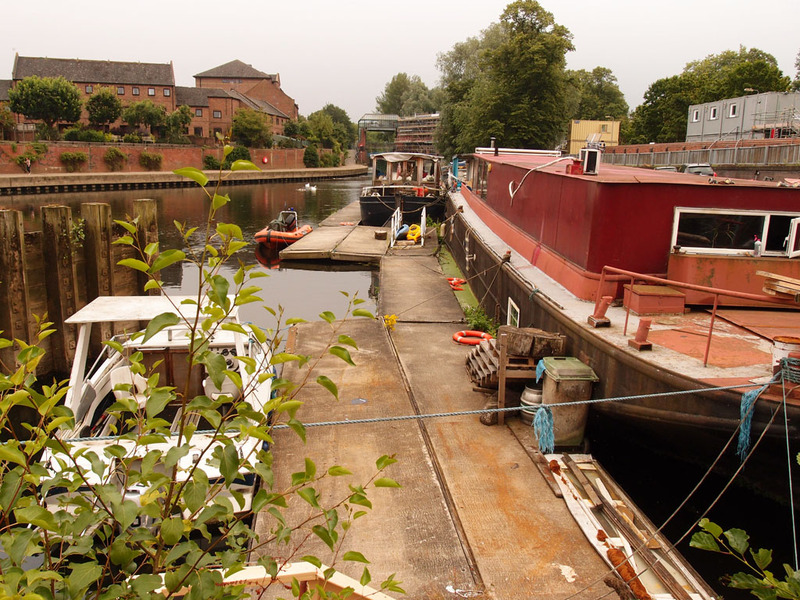 I’ve seen comments suggesting that the Foss Basin should be more lively, interesting, busier, and that it should look to Little Venice for inspiration. ‘Little Venice’ is in London. It’s a place named after/reminiscent of another place. For a part of York to aspire to being more like another place named after another place doesn’t really do it for me. Particularly as the word ‘affluent’ appears in descriptions of it. 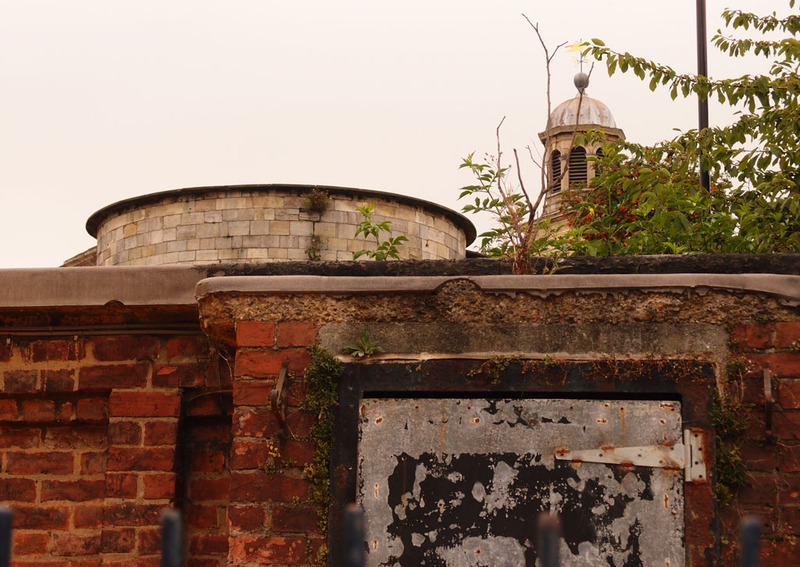 This city of York, in its centre, has gentrified itself already to a point where many of us barely recognise it. Making something posher and busier might bring in more money for a few people but it can alienate and push out the people who used to feel connected to the place. I’ve felt increasingly disconnected from York, as it is now, as it has become. But down here, by Castle Mills lock, just me on my own, with the occasional person passing by on their way somewhere, I get it again, that feeling I get less often — rarely, now — in the historic core of the city I was born in and grew up in and have lived in for nearly fifty years. There’s so much here that speaks of the place that it was, and is, just small quiet things, unlabelled, overlooked, ordinary. The carved numbers, so carefully and beautifully done, at the edge of the lock, worn by water and time. 14, 15, 16. The maker’s name on ironwork associated with the lock’s operations. Stockton, it says. All the way from the Tees. Many queries, things to look up later, or perhaps discuss back home. The kind of investigation of place and the details of place that ends up making amateur local historians of so many of us, as it goes on and on as we dig through the layers, pursuing particular interests in particular places, getting it at last, how it works. This place sits quietly, with its stories, and soon no doubt there will be signs attempting to present those stories, in a simplified form, and the smartening up of it, and the painting of its ironwork, and the filling of its silence with chatter and no doubt there’ll be another café, or several, and all the people involved will be pleased and congratulate themselves on its reinvigoration. It will attract the ‘right kind of people’, according to the definition of people who call in to radio phone-ins and use phrases like that. I don’t feel I connect to what’s being said there, so maybe I’m not the right kind of person. For now, this place is settled into itself, just there in the landscape, with so much to tell if we just put a bit of effort in, sit quietly, walk through it, look, read the old books. 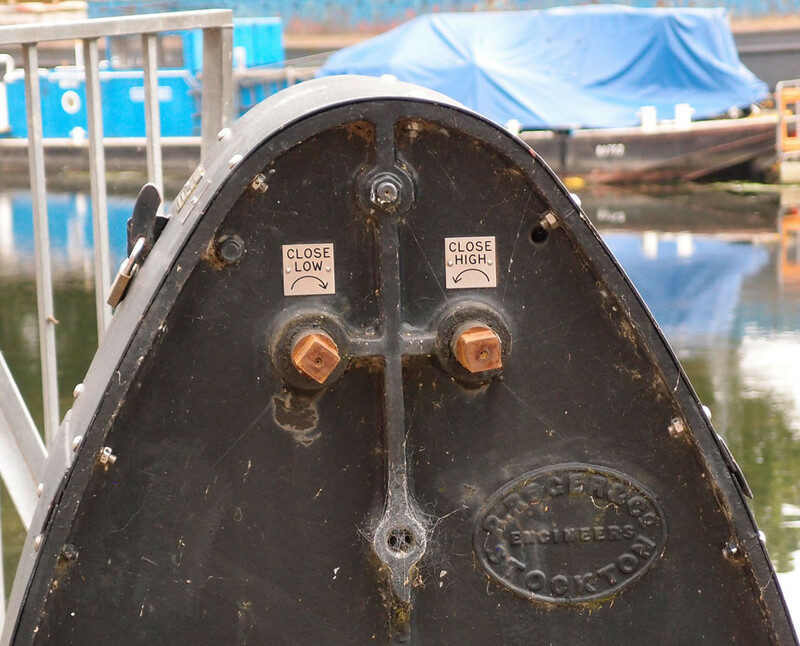 As I’m drawing to a close this short series of pages on the Castle Gateway area, I don’t want to ‘close low’, to use a phrase that comes to mind from the controls on the nearby Castle Mills lock. So let’s close high instead. But let’s pretend we can, as it saves trying to cross the busy road of Tower Street. Very poignant but don’t let it get you down. There are still places which haven’t been ruined by ‘modernisation’ or gentrification: small places and fairly well hidden places. Places that still evoke memories from our not so recent past. Through these pages you’re helping others to find them and you’re helping to preserve them for others to enjoy. Chin up and keep digging. The area of Foss Basin recalls memories of the Fair on St. Gerges Fields; the St. Georges baths, where I learned to swim by being thrown in by my older brother, and the Dog’s Home which was situated immediately to the left of the ‘no parking’ gateway in the above photos. (I lost my virginity in that location one evening after a visit to the Scala cinema). I was born in York in 1936. 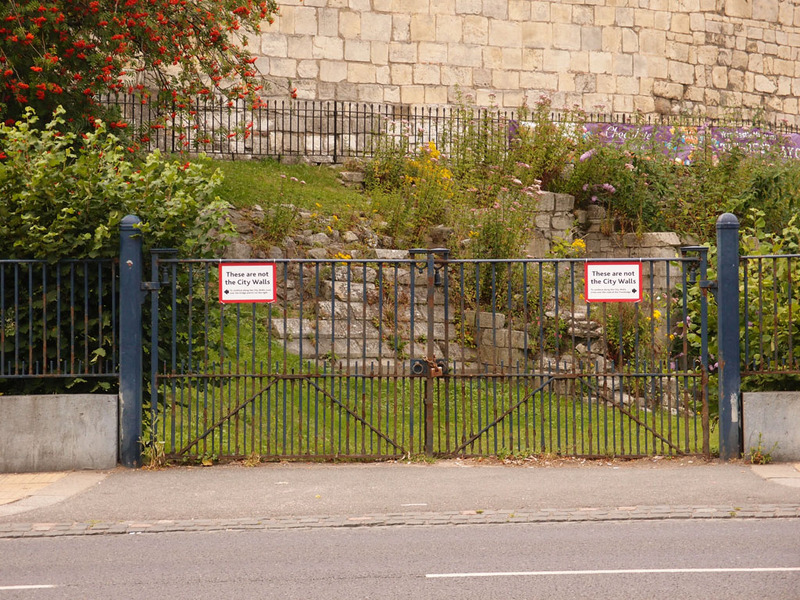 Myself and my boyhood friends walked everywhere to get to the multitudinous entertainment venues that York had to offer the young lad/man through the 40s and 50s. 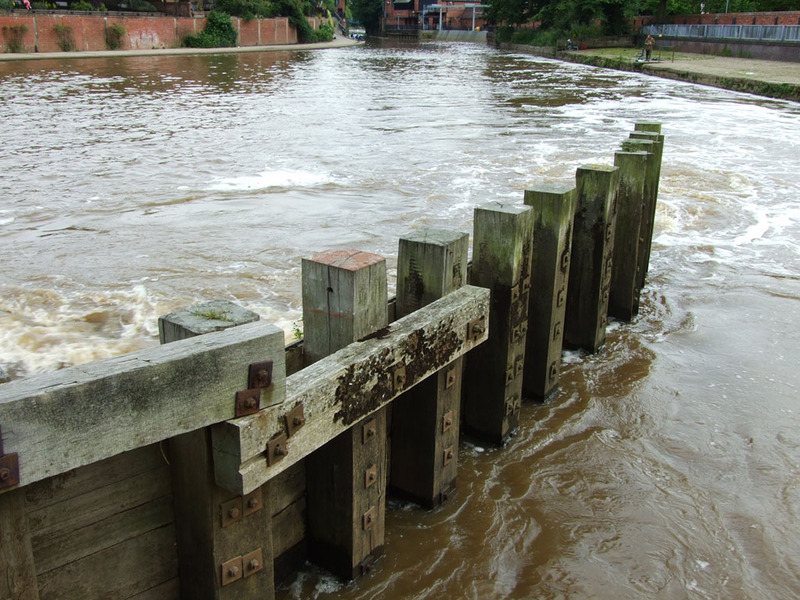 The Foss Basin was the poor relation of the Ouse after the two rivers split off at Blue bridge. Much rubbish, including dead dogs and cats were to be found in the basin and further up the Foss as it wound its way out of the city into the suburbs. Boats could not navigate beyond Foss Islands Road where the Gas Works were located. (The hours my brother and I queued there for a sixpenny bag of cinders for the fire).Among my cherished memories of York are the numerous times we used the ‘bar walls’ as out conduit to the city centre, joining at Walmgate Bar coming from Tang Hall down the Hull Road, to get off at the Red Tower to go to the Fair, the baths, or the rivers for a mess about. 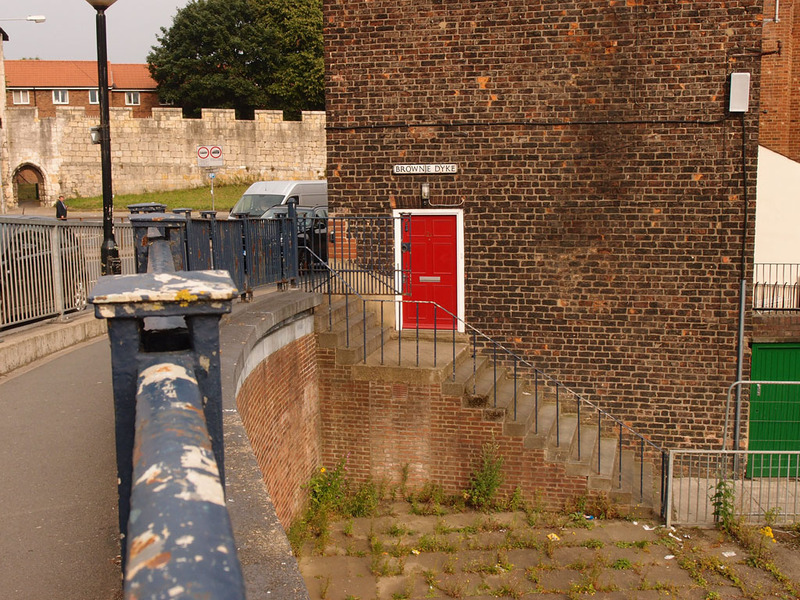 We would return via Walmgate where to my childhood recollection, almost every other building was a pub. ( All spit and sawdust and bursting at the seams with customers).Where has all that character gone?! Love your prose Ain and incisive memories of my ex home town,exactly like yours tho’7 years earlier.Nice to know my generation is still around,After York growing up and marriage I honey mooned then lived in Menai Bridge for a while ,and remember it fondly,good luck for the future.